Ramateertha, the center leader of the Cologne OSHO Uta Institute, has over the years made several attempts to attack and to undermine the work of Osho. He has done this through interviews, open letters and in addition by creating organizations whose sole purpose was to remove the legal protection to Osho’s work. Osho gave specific instruction to create the following entities: Osho International Foundation (OIF) - the foundation which Osho created to hold his copyright and trademarks and to publish and license his work; the Inner Circle (IC), a team of people Osho put in place with the function to administer his work in Pune after his departure; and the OSHO International Presidium which for the most part overseas the international expansion of his work. While creating these entities, Osho did not ask any of us what we thought about it nor as far as we know did he think it necessary to ask Ramateertha or others about their views on this aspect of his work – or any aspect of his work for that matter. The protection of Osho’s work by copyright and trademarks was put in place by Osho himself during his lifetime and was confirmed in writing and during legal testimony by him on multiple occasions. publications and programs, products and activities offered. He specifically asked Jayesh – the Chairman of the IC - to protect his new name in exactly the same way “RAJNEESH” had been protected before. Osho personally initiated the process to replace the old mark Rajneesh with the new OSHO mark. As previously noted rather than supporting Osho’s requests for his own work, Ramateertha decided to do the opposite and to attack the legal protection of Osho’s work through an organization he created called, “Friends of Osho Europe.” This organization attempted to strip the trademark and copyrights to Osho’s work away from OIF. With almost no support from sannyasins or other OSHO Centers, the organization was closed in 2005. In 2010 Ramateertha started a legal trademark case in Europe against Osho International Foundation through an organization called Osho Lotus Commune e.V. which was originally the “Anand Sagar Rajneesh Meditation Center,” a center name given by Osho to Ramateertha in the early 80’s. In this new legal action Ramateertha presents Osho Lotus as the defender of Osho and Osho’s name and circulates half truths, misleading information, and accusations against the Inner Circle, Osho Global Connections, (an office created to take care of Osho Meditation Centers) and OIF. He accuses these entities of lying, misleading, cheating, as well as, being manipulative and dishonest…. He calls the Inner Circle a group of “would-be leaders” neglecting to mention that it was Osho himself who not only created the Inner Circle, but Osho who also appointed the Chairman and Vice-chairman and gave specific instruction on how it was to operate, which is how it continues to operate to this day. Osho Lotus Commune e.V. is the shareholder/owner of a group of companies that are the core of the Cologne Buddhafield, the Osho Uta Institute, Osho Verlag (Osho Times), Osho’s Place and Meditation & More. These companies are the heart of the “Cologne Buddhafield,” supported by Osho’s sannyasins who go to the Cologne Osho Center, participate in Osho’s meditations and in groups – which are run, for the most part by sannyasin therapists – eat at Osho’s Place, read the OSHO Times, and purchase Osho’s books, videos and audios. 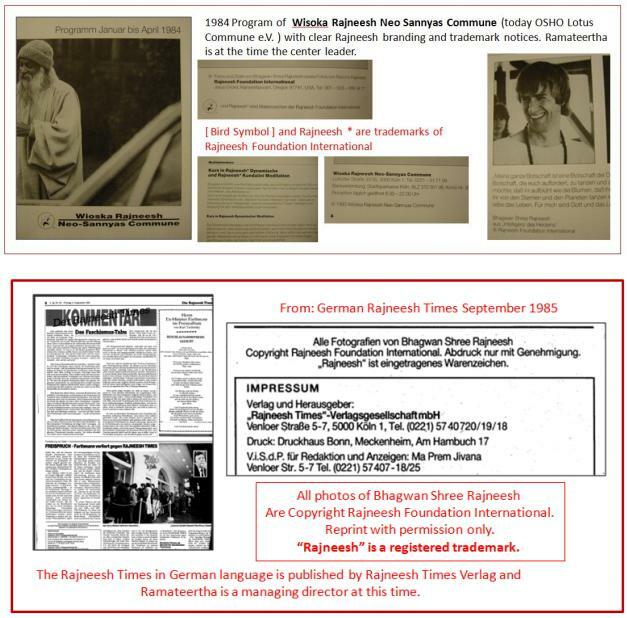 As his former plan via “Friends of Osho Europe” had no support, Ramateertha now uses the Cologne sannyas scene for his legal action by using the ownership of the Cologne Buddhafield companies to take legal action against the entities and people Osho personally appointed to take care of his work. We wonder if he consulted with all the people there when he started his action or is this in fact a personal crusade. We wonder if Ramateertha is using the Cologne Buddhafield to fund this very expensive legal action. On whose authority and with whose money is Ramateertha using an OSHO Center to attack Osho’s work? Given the kind of vicious accusations Ramateertha is directing at the people and trusts Osho left to overview his work, the question naturally arises as to whether the participants of the Cologne Buddhafield were consulted about all this. In particular, were they consulted about using these funds for a costly lawsuit against Osho’s wishes rather than using this money to support Osho’s work? In 1985, after Sheela left, Ramateertha was himself suggested by Osho as a director of Osho International Foundation, the foundation who took over the legal aspects of Osho’s work after he left the USA. In 1986 Osho asked Hasya, Osho’s then International Secretary, and Jayesh, later the chairman of the IC, to obtain Ramateertha’s resignation from Osho’s foundation, which they did. name to brand all aspects of his work. RAJNEESH was used to brand meditations, places, centers, foundations, and that for the restaurants and discotheques that were started in Cologne by Ramateertha Osho gave the name, “Zorba the Buddha Rajneesh Discotheques”, which became registered trademarks of the foundation and it was Osho who suggested to rename them to Zorba the Buddha OSHO Discotheques. Ramateertha would probably also know that in 1975 Osho personally designed the first logo for his foundation and that later Osho personally designed the two flying birds symbol both registered as trademarks. And again, that in 1989 Osho selected the new swan logo – which like his name at the time, RAJNEESH were registered as trademarks. OSHO (Rajneesh Verlag to OSHO Verlag) etc…. founder of a religion or a religious movement and expressly states that he did not want to be placed in any religious context. Osho did not include Ramateertha in any of the bodies he created to oversee his work at the end of his life. Ramateertha was never asked to be a member of the Inner Circle nor the Presidium nor any body or trust created by Osho with the exception of OIF in 1985 and in this case Osho specifically asked for his resignation a short time later. Before Osho left his body he made it very clear that his centers are to promote his work and to direct people to Pune and are not places in which other guru figures, or ex-sannyasin who had turned against Osho, should be offered a platform to spread their own messages. Recently we received some links to videos and images of Ramateertha sitting beside (for a photo op) and at the feet of, U.G. Krishnamurti (not to be confused with J. Krishnamurti). U.G. 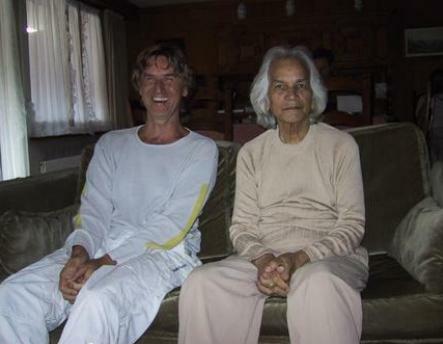 Krishnamurti spoke often about Osho, most often in the ugliest of terms and Osho spoke against U.G. Krishnamurti, even in his last series of talks, in no uncertain terms. Attached is a video link of an excerpt where Osho goes into some detail about UG. Ramateertha was also aware of and took part in the rebranding – directed by Osho - that occurred when Osho changed his name from Rajneesh to Osho. Osho International Foundation instructed changes of all names from RAJNEESH TIMES to OSHO TIMES (international and German editions); corporations and centers were also asked to change from RAJNEESH to OSHO (Rajneesh Verlag to OSHO Verlag) etc…. Recently we received some links to videos and images of Ramateertha sitting beside (for a photo op) and at the feet of, U.G. Krishnamurti (not to be confused with J. Krishnamurti). U.G. Krishnamurti spoke often about Osho, most often in the ugliest of terms and Osho spoke against U.G. Krishnamurti, even in his last series of talks, in no uncertain terms. Attached is a video link of an excerpt where Osho goes into some detail about UG. OSHO or in any other context. Much more detailed material submitted in evidence in this European Trademark case started by Ramateertha is publically available for review at www.osho.info .